"French Style - How to Think, Shop and Dress Like a French Woman" was published by Express (the clothing store) in 1993. The book design is unusual. It is a an oversized 10" by 9" soft cover book with a stiff book jacket cover making it a cross between a hard cover and soft cover book. The text is illustrated with line drawings and a number of photographs (mostly black and white). It helps you learn to THINK like a French woman. It will help you learn to make the decisions a French woman would when shopping, dressing, playing and more. French woman are known for their chic appearance and attitude. 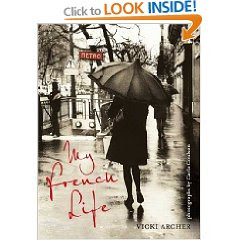 Within these pages Vienne who was born and raised in France conveys what it is that makes the French woman so stylish. She begins by looking to the past. A look at how the French fashion evolved. Then she shares the purebred classics that make the French look - items such as the supreme black turtleneck, hermes scarf, red gloves etc. Vienne encourages you to "epater les bourgeois" that is shock say a French matron. Here is where you wear things that will raise the eyebrow such as a sweater turned inside out, sunglasses in the rain etc. As Vienne says "you cannot have style without breaking the rules". Take what you have and add little twists to make it special and give it style. In the States we dress "appropriately" in France a French woman will push buttons - be surprising and fresh. Vienne gives a list of "do's" and "don'ts" and she gets into "Le Shopping". Armed with more attitude than cash the French woman will use her wits and savvy to find the very best. Like the design itself this book is very unusual. Not your usual dress like this fare. This is a book that goes beyond the obvious of what is style and helps explain the mystery of how to make style yours. French style is not a trend, it's a way of life. A way of thinking and feeling. Veronique captures that in this book!